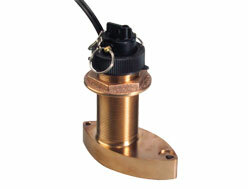 Bronze Thru-Hull Triducer with High Speed fairing block. The Lowrance Bronze Thru-Hull, style B744V, 600w, multisensor provides accurate depth, speed and temp readings and comes with a High Speed Fairing Block. The high speed fairing block provides a streamlined installation and allows for a vertical beam. Compatible with Lowrance HDS, HDS Gen2, HDS Gen2 Touch, HDS Gen3, Lowrance BSM-1,Lowrance Hook, Simrad NSS, Simrad NSS evo2 and Simrad BSM-1.